FLIO’s "Digital Airport Experience" is the first-ever winner of the special "Best Customer Journey Experience" category at the Crystal Cabin Awards. German startup FLIO has won the very first Crystal Cabin Award in the special "Best Customer Journey Experience" category. In the final round of three, the Hamburg-based app developer's "Digital Airport Experience" overcame "Flagship First Customer Journey" from American Airlines and "Virtual Reality Passenger Experience" from Inflight VR with Airbus. The special category award was presented within the framework of the APEX EXPO and AIX North America trade fairs in Boston on the east coast of the US. The Crystal Cabin Award is the world's leading honor for aircraft cabins and products. Almost 30 jurors from across the spectrum of civil aviation and all its segments decide the winners. The award ceremony in Boston also ushered in the new submission phase for the eight main categories of the Crystal Cabin Awards, to be presented in Hamburg on 2 April 2019. The winning "Digital Airport Experience" of the Hamburg-based start-up FLIO has become the world's most widely used airport app for smartphones by now. It includes detailed flight and airport information, terminal overview maps, as well as direct booking options for lounges or transportation at airports worldwide. 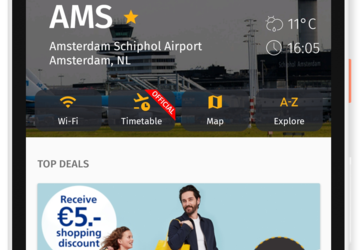 First airlines have started to integrate FLIO services into their own apps as well. The app is aimed at passengers of all booking classes. "Best Customer Journey Experience" comprises all products that help to improve the customer experience journey (inspiration, planning, booking, purchase, pre-trip, departure, in-flight and post-trip) across airline travel categories. It includes technical end-to-end solutions across categories including applications, artificial intelligence, tools, devices, software, programs etc. The product should offer benefits for airlines, OEMs, and/or suppliers by offering new digital solutions and specific insights about passengers experience for the benefit of on-board technical utilization. The finalists and award winner will provide airlines and their suppliers an inspirational example on how to optimize the cabin for end-to-end travel solutions centered around personalized passenger experience. This special category complements the existing eight categories awarded each year in Hamburg for the Crystal Cabin Awards: "Cabin Concepts", "Cabin Systems", "Greener Cabin, Health, Safety and Environment", "Inflight Entertainment & Connectivity", "Material and Components", "Passenger Comfort Hardware", "University" and "Visionary Concepts". Winners of the 2018 season included renowned industry players such as Airbus and Altran, Rockwell Collins, and PriestmanGoode with Qatar Airways. In parallel, the submission period for the eight main categories of the Crystal Cabin Award has started. Until 24 October, the Crystal Cabin Award Association and its 28 expert judges are looking for the top innovations in commercial aviation for 2019.